A “cleanse” for many patients means purging the contents from the bowel. Although, this sounds good, it may actually be causing them more problems. Think about when a patient is under gi distress - and a patient may have a rapid transit of stool. The stool comprises about 70% of flora, so a focus on supporting healthy bowel elimination is important. Their idea of cleansing may actually be causing them to be unhealthy; and it’s up to us as their practitioner to educate them on how, and why, to cleanse while emphasizing the role of detoxification to achieve the best results. Detoxification typically includes but is not limited to colon cleansing. Unfortunately, sometimes the two are used interchangeably. 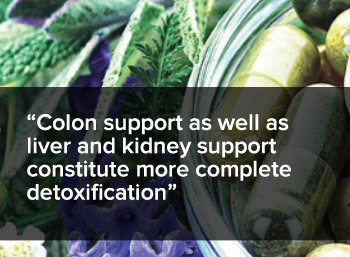 Colon support as well as liver and kidney support constitute more complete detoxification. Purging does not effectively detoxify or clean the bowel wall. Patients may want to do a colon cleanse because they feel their bowel is “congested” or because they are not having daily bowel eliminations. As a first step, help them understand that they can use healthier methods to soften the stool and achieve regular bowel movements versus a weekly purge. Options such as Vitamin C and magnesium can greatly support bowel regularity. Once the body gets enough C and magnesium the rest remains in their intestines and through osmotic effect, creates a softer stool. Vitamin C and magnesium are often depleted by stress. The goal is to keep patients regular while also providing nutrients to the body’s cells. Dosing of vitamin C and magnesium to support bowel health should be done to individual tolerance. Reminding patients about the basics of fiber intake and its ability to clean the bowel daily is a simply yet often overlooked advice. Not only does fiber create better transit of the bowel by increasing volume and weight, but it also helps support a healthier bowel environment and supports a healthy microbiome. Many patients may be willing to increase their fiber by supplementation; however, increasing fiber by too much or too quickly can have unwanted effects. Parietal cells in the stomach produce hydrochloric acid, which, as one of its functions supports immune system defenses. In the small intestine pancreatic enzymes help digest fats and proteins in particular. Since digestive enzyme secretion is primarily controlled by the parasympathetic nervous system, a relaxed eating environment can help. Many patients will consider slowing down and more conscious eating impossible. Given that scenario consider introducing supplemented enzymes with meals. Additionally, use of full strength, undiluted, and uncut pancreatic enzymes between meals periodically may be worth consideration.